WINNER: Neve 7R – chosen by Mr Gaughan. A simple but eye catching design featuring a quote by author Neil Gaiman. Neve won a £10 Amazon voucher, and her fantastic design will be made into the official Holy Cross bookmark of 2019! FIRST RUNNER-UP: Lucy 8L – a colourful artistic design featuring popular book characters. 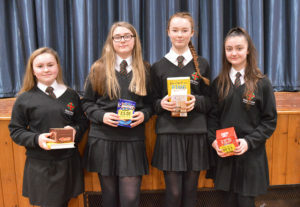 Prize = £5 book fair voucher. SECOND RUNNER-UP: Charli 8S – a clever and colourful design. Prize = the new book by David Walliams. Mr Gaughan said this was the toughest year yet, as he struggled to choose a winner from all the fantastic entries! Harry 7L – Book cover design – Harry’s take on a Barry Loser book won him a £5 book fair voucher. Toby 7L – guessed correctly that Diary of a Wimpy Kid had been borrowed from the library more times than any other book. Prize = the new book by David Walliams. Sophie 8Y – got the closest figure when guessing how many Accelerated Reader books we have in the library – in fact she was only 15 off the correct figure! Prize = the new book by David Walliams. Ava 7R – wrote a lovely piece about her favourite book Mr Lemonchello’s Library. Prize = £5 book fair voucher. Mia 8X – got most questions correct in the big book quiz. Prize = £5 book fair voucher. Liv 7C – matched the most staff names to their favourite books. Prize = £5 book fair voucher. 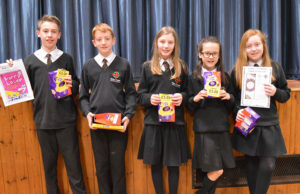 Thank you to everyone that got involved and entered the competitions – a fantastic effort from Holy Cross pupils yet again.